The shop is located just inside the entrance of the club and is open to members and non members alike. It is a treasure trove of some 150 different products. Opening hours are Monday to Friday, 9 am to 5:30 pm. You can request to park in the car park. Please ask in the office for assistance. Now the most prestigious and successful club in the world, Leander can boast athletes winning more Olympic medals than any other single sport in the world! Leander's emblem is the hippopotamus, known in Africa as "King of the River", the only animal equally at home on land and water. 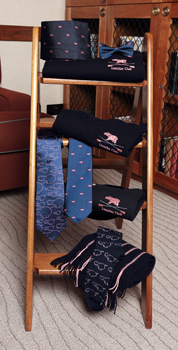 It's colour is pink (officially cerise), as it Leander's club tie. 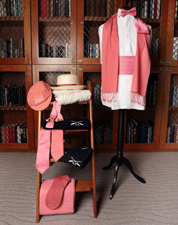 Only members with distinguished service to rowing are permitted to wear the coveted pink livery. Leander was a figure in Greek mythology and the lover of Hero, virgin priestess of Aphrodite. Their love story was told by English poet and dramatist Christoper Marlowe in his poem "Hero and Leander" (1598).